This article is about the musician. For the journalist, see Sean O'Hagan (journalist). For the strongman, see Sean O'Hagan (strongman). 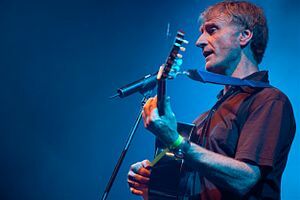 O'Hagan is a founding member of the Irish indie band Microdisney, alongside Cathal Coughlan; the band initially formed in Cork but was based in London from 1982 until their split in 1988. He released a solo album titled High Llamas in 1990, which would become the name of a band he subsequently formed. The High Llamas were influenced by the Beach Boys, Ennio Morricone, Antonio Carlos Jobim and avant-garde electronica. He has also collaborated extensively with Stereolab, he was an official member from 1993 to 1994, and is credited as a guest musician on later releases. In the mid 1990s, Brian Wilson was attempting to organize a comeback album with the Beach Boys and collaborator Andy Paley. After the group's Bruce Johnston heard Hawaii (1996), an unsuccessful attempt was made to coordinate a collaboration between O'Hagan and Wilson. According to O'Hagan, he attended one meeting with Wilson and two with the Beach Boys, but the "two separate camps" within the group couldn't be reconciled. In 1996, he collaborated with Tim Gane as Turn On, releasing an album of the same name on Drag City Records. They also worked together on the soundtrack to the film La Vie d'Artiste. On 27 November 2017, it was announced that O'Hagan and Coughlan would reform Microdisney for a one-off concert in the National Concert Hall, Dublin on 2 June 2018. Coughlan subsequently stated on his website that due to the sellout of the Dublin show, they would be performing a one-off in London as well. They are scheduled to perform the album The Clock Comes Down The Stairs in full. ^ Page, Tim (2002). "The High Llamas". Tim Page on Music: Views and Reviews. Amadeus Press. ISBN 978-1-57467-076-9. ^ Carlin, Peter Ames (2006). Catch a Wave: The Rise, Fall, and Redemption of the Beach Boys' Brian Wilson. Rodale. pp. 280–291. ISBN 978-1-59486-320-2. ^ Lester, Paul (June 1998). "The High Llamas: Hump Up the Volume". Uncut. ^ Lien, James (October 1997). "Sean O'Hagan: The Highest Llama". CMJ New Music Monthly. Vol. 50. ISSN 1074-6978. ^ Wolk, Douglas (9 March 1999). "REMIX MANIA!". MTV News. This page was last edited on 28 November 2018, at 01:21 (UTC).